I’ve entered into another sketch challenge today that comes from Freshly Made Sketches, and is linked to their blog for this week’s challenge. I’m once again using the NEW Sparkle & Shine Paper Packet that will be released on October 15 in the Holidays From The Heart Gift Guide. Using Ruby Exclusive Ink® and Cocoa Exclusive Ink® and the Remarkable Wreath stamp set to create this wreath. This stamp set is so versatile as it can be used for every season. I “fussy cut” the stamped image and adhered it to the card with 3D Foam Tape. I also added Liquid Glass to the berries on the wreath to give the card a bit of shine. 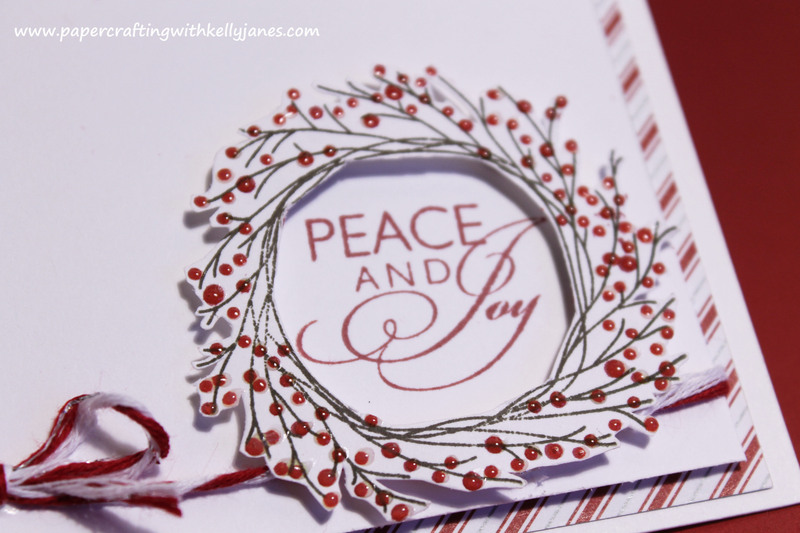 The sentiment is also stamped in Ruby Exclusive Ink® using the stamp set from the Workshop On The Go® Frosted Cardmaking Kit. This fabulous Baker’s Twine is from the Mini-Medley Accents Ruby Collection. I love that shimmer of silver that is braided into the twine!! Remember to check back on October 15 to see all of the available merchandise in the Holidays From The Heart Gift Guide!!! Sweet sweet wreath! Thanks for joining us at FMS! Very pretty card Kelly! I love that wreath! Looks great with the liquid glass! Love the red and white! Thanks for joining us this week at Freshly Made Sketches! Thank you, Jen!!! I appreciate those great compliments!! !